Highland Cattle - HOLY CROSS FARM: Above & Beyond Organic! Click Here For a Review of The Best Steaks in the World! Hair Coat: The double hair coat (long, coarse outer layer and soft wooly inner layer) is one of the most notable differences between Highlands and other breeds. The coat reduces the need for expensive barns and shelters. Due to the double hair coat, this breed does not need a heavy layer of backfat for insulation. This allows the animal to marble naturally on low input forage while producing lean, low fat, high quality cuts of beef. Highlands shed out earlier in the spring and produce less hair in a warmer climate, making them suitable for a variety of environments. Easy Handling: Highlands have a long history of living with humans. Early Scots would keep the family cow(s) inside their homes during the winter. A woven wattle fence would separate the animal’s living areas from that of its owners, with both sharing the added warmth. Highlands tend to be docile and calm and do not stress easily. They are easy to work with despite their long horns. The horns are used primarily for knocking down brush to graze, predator control and scratching. Horns on females are generally upswept and finer textured than those on the males. Male horns are more forward pointing and massive. Exceptional Mothering and Calving Ease: Highland cows are noted for being highly devoted and protective mothers. They are noted for calving ease. Due to small calf size (60-70 pounds), calving difficulty (dystocia) is less common. Cows may produce into their late teens reducing the need for frequent herd replacement. Browsing/Grazing Ability: These cattle are excellent browsers. They have been used in the US and worldwide to clear brush lots, for Oak Savannah restoration and grazing improvement projects. Highlands perform well in a variety of feed scenarios whether brush, forage/grass based or grain finished. Outstanding Beef Quality: Unlike other breeds, Highlands are slow maturing making the meat tender, flavorful and succulent. In a study at Manyberries Research Station, Canada, groups of Hereford, Highland and Highland/Hereford crosses were tested. The Highland group produced 2000 pounds more beef than the Herefords. The Highland/Hereford crosses produced 6000 pounds more than the purebred Hereford group. Highland cows will average 900-1200 pounds when mature. Bulls will average from 1500-1800 pounds depending on forage conditions. A study by the Scottish Agricultural College determined that Highland beef is lower in fat and cholesterol and higher in protein and iron than other beef breeds. Highland cattle societies are also found in Scotland, Australia, Austria, Canada, Denmark, Estonia, Finland, France, Germany, New Zealand, Norway, Sweden and Switzerland. 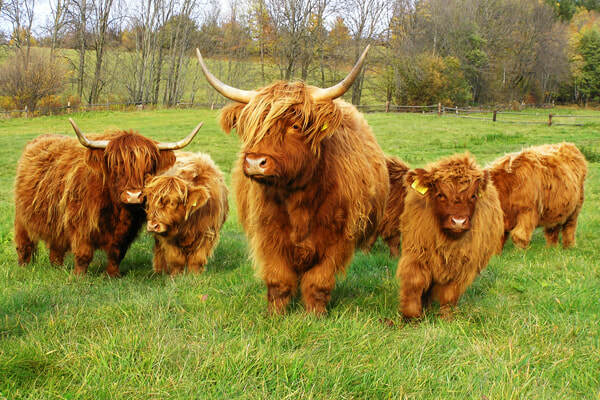 The animals are referred to as Scottish Highland cattle, Scotch Highland cattle or Highlanders. Highland cattle provide the opportunity to produce a premium quality beef with less cost and effort. They fit into a variety of operation styles, from the small farm to large commercial beef operations. See here for the Best Steaks in the World!